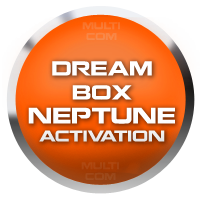 Activation DreamBox SE dla DreamBox Plus allows easy update to leatest SE edition of DreamBox. BY makign this activaiton to existing Siemens Box you can flash/repair product for Sony Ericsson DB2020, CID 49/51/52 and Siemens handsets. Among features you will find: Repair GDFS, Standalone permanent unlock by Testpoint, Multiflash FOTA/Main Firmware/File System using DCU-60 cable, Easy unlock by patch (CID52 only), a large and convenient flash files database..
DreamBox NEPTUN activation it's standalone AID4 unlock for Sony Ericsson F305, S302, S312, W302, W395 by TestPoint. To work with NEPTUNE you will need to buy an activation.